Next time I am in US, this is the first thing I will get before I get on plane! I think it's in Germany, so you may want to order it directly. Ordered one and receiced it today. I wonder what the test slide is good for. It is not what I thought it would be and if it can be used for testing resolution then it must be for a setup very different from mine (tube lens + infinity type objective). I confess I ordered it blind as I don't really understand German. Anyone else wondering about the usage of the slide? What's the problem? Is it that it is for reflected light? Can you comment on the image, is it OK? I'll make this my reference image. Should I expect for more? Would love to see testimages from others using this slide. 20 x 0.7 = 14.4µ, which is very few pixels. So you'd need to enlarge enough to be able to see the individual pixels, I think. I think the lighting may prove to be important. One pixel is 0.32 microns here, right?. If the white lines are 1 micron in width then that would make 3 pixels width when straight up-down. That calculation is about OK here from the theorethical point of view, but practice might well be something different. 0.32 microns is also about the theorethical limit for red light so maybe the resolution here is OK? Lighting is critical as a source of contrast, I think. I am using undiffused light here. 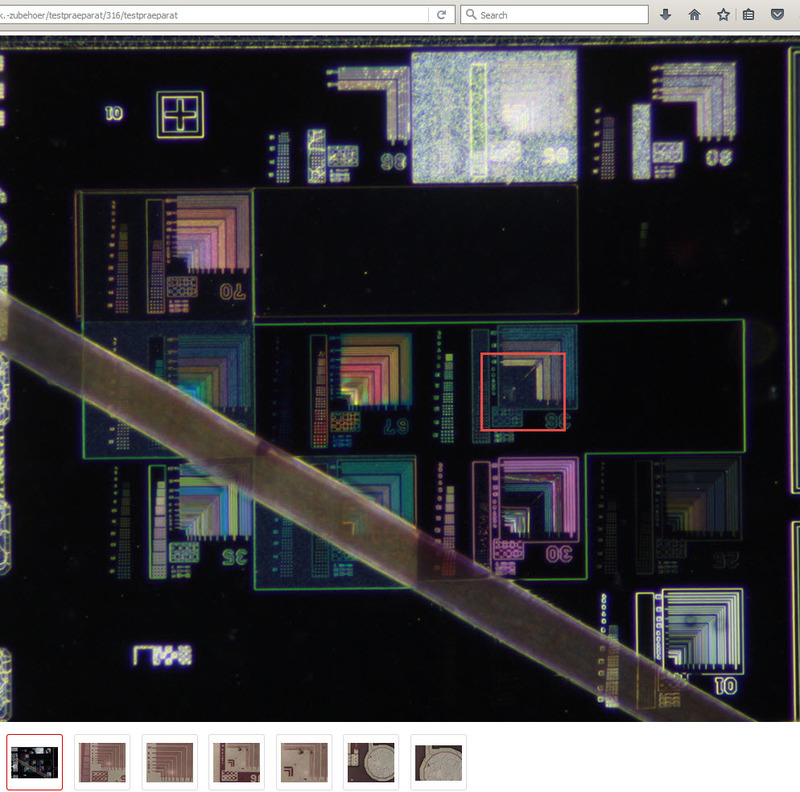 0.32µm being 6.4µm / 20, ie one pixel on subject. Agreed that lighting is a critical source of contrast. However, lighting is also a critical source of resolution with reflective subjects, which these appear to be. This fact too is often overlooked. Undiffused light is certainly contrasty--but with reflective subjects, undiffused light kills resolution. Thus. effective analysis of resolution can, with reflective subjects, only be measured with widely diffuse light. This is due to what we've come to call a "utilized aperture" effect. A subject that produces directional reflections will, if illuminated by a narrow light source,often fill less-than-the entirety of a lens's entrance cone with light. This means that less than all of an objective's numerical aperture is utilized, producing a result much like that of an objective with a smaller numerical aperture--lower resolution. And as an additional confounding factor, whenever a combination of subject and lighting utilizes less then the full lens aperture, individual subject details are likely to utilize more or less aperture than other details. This would make it very confusing to determine lens resolution in such an arrangement. Since you are using this subject to measure resolution, I'd suggest you try the most diffuse lighting possible:; let your lighting evenly cover all of the "sky" as seen by the subject. Agreed that this may produce less contrast; but it may be needed to produce top resolution. Since resolution is the element being tested, maximizing for it seems appropriate. This said, I haven't seen this test slide with my own eyes. It certainly looks like the sort of reflective subject that can only be recorded at full resolution with diffuse lighting, but I speak only from pictures I've seen. Chris, you are right, the stuff in the slide is very reflective and shiny and focusing on the stuff is quite difficult. That's why my first impression of the slide was that it is really not suitable for resolution tests. I did try to manage the shiny reflections with a linear polarizer in the image I posted. The image above was already my "best attempt" to kill the reflections. Also some of the details of the slide that are found on the product info images are missing and the surface texture/material is also much different from those shown in the images in the product info. That said this is the first time I ever see a microscope resolution test slide so I didn't really know what to expect. I was hoping that someone here with more experience about test slides would have already tested the usefulness of this particular slide and would have offered a comment. It's certainly not very easy to use. The patches are at very different contrasts, some being tricky to see at all unless the lighting is just right. I agree that this slide will not be useful for most members of this forum. 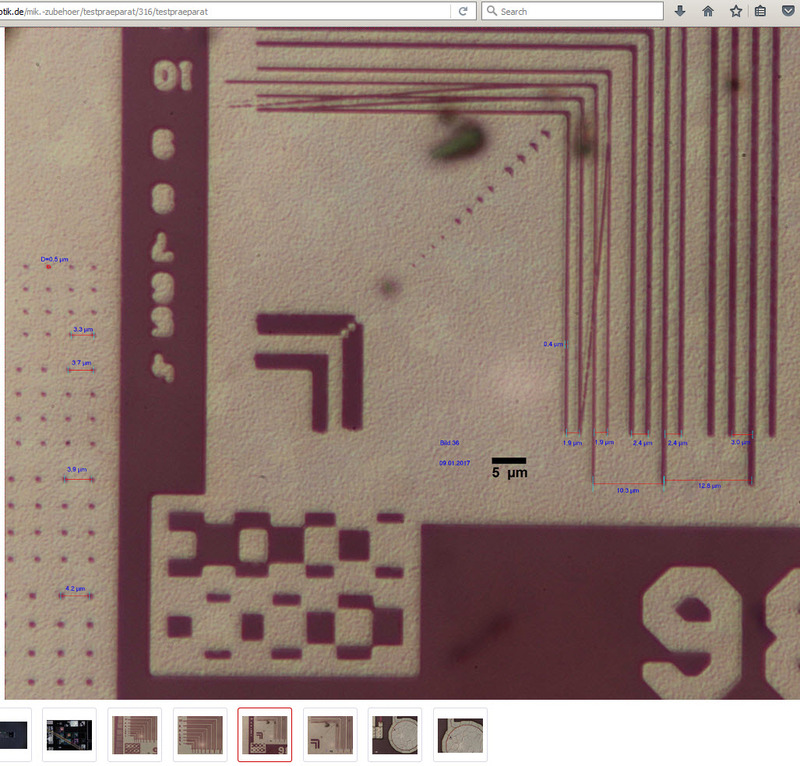 I'm guessing that this is a chip of etched silicon, perhaps with the photoresist still in place. As a result it is extremely shiny. With most of our usual lighting arrangements, when the chip is held level (perpendicular to the objective), the flat surface of the chip appears to be black because it acts like a mirror and reflects only the black hole of the objective back into the objective. Some textured regions and 3-D step edges of the pattern do brightly reflect illumination that comes from around the objective, but even in the best case those reflections will strike only a portion of the aperture so they suffer from "utilized aperture" effects such as apparent lateral movement as focus is changed ("the wigglies"). Now having the chip in hand, I can understand the illustrations on the supplier's web site. Following are two of them, captured as screengrabs from my browser. This first image is a view with something like a 4X-5X objective, illuminated as usual around (not through) the objective. 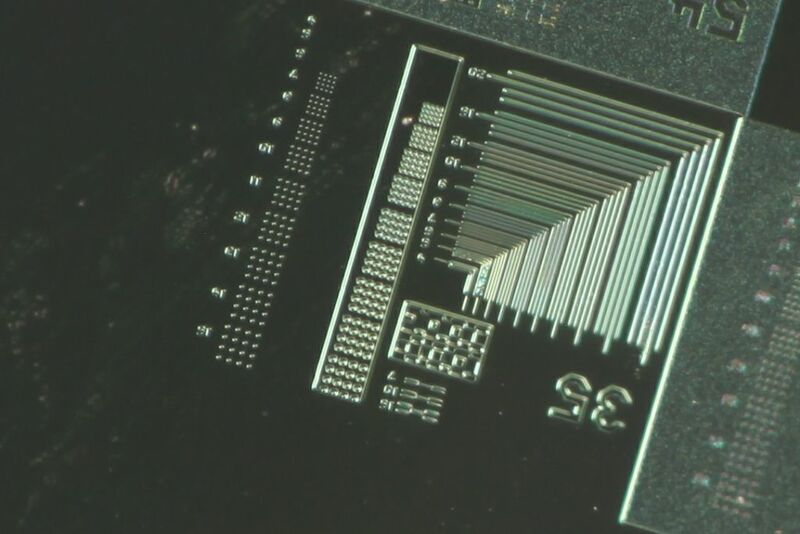 Most of the chip appears to be black, with some 3-D step edges of the lines appearing bright. The colors in this view are structural, produced by diffraction from gratings of different spacings. 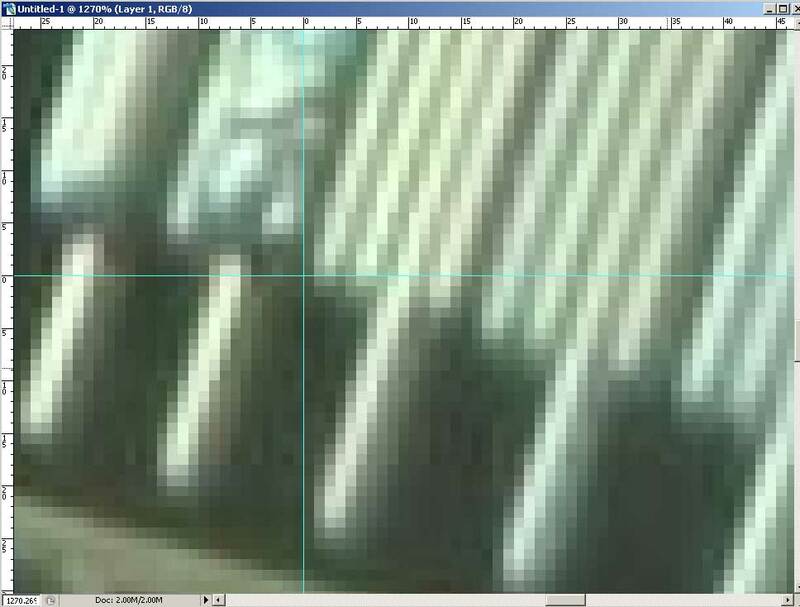 In this image, I have added a red rectangle to show the area that is magnified in another of the vendor's images. 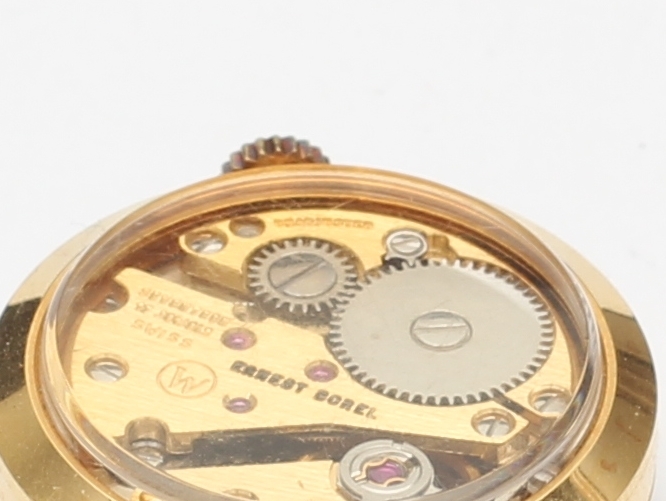 Then, here is the magnified view. Notice that in the following image, the contrast appears to be inverted -- most of the area is bright while the lines are dark. I can easily reproduce this appearance using a 40X metallurgical objective, but only by using "episcopic brightfield" illumination through the glass of the objective. In this case the flat mirror-like surfaces render as bright, while the less reflective lines render as dark. 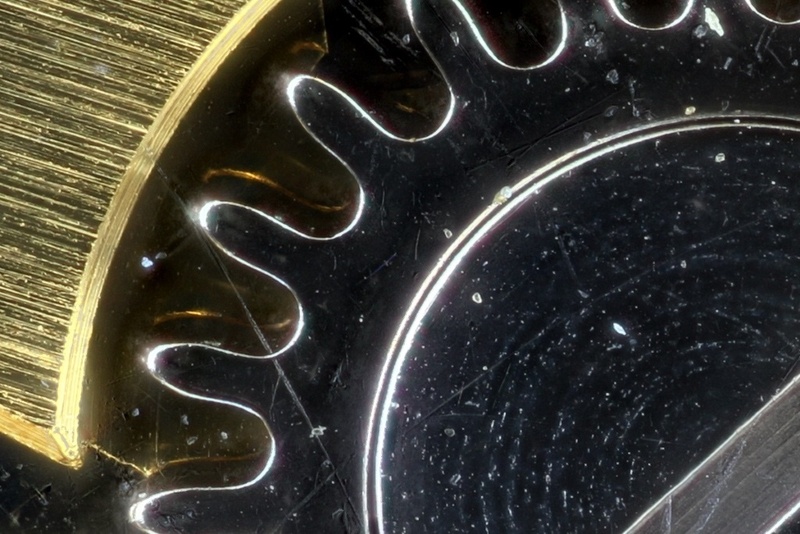 The chip would be an excellent test subject for resolution in a metalurgical microscope, especially one using episcopic brightfield through-the-glass illumination. For our macro rigs, and especially for any sort of a standardized test, the chip is close to useless because its appearance depends so strongly on the illumination. The patch at the top, between 98 and 08, is showing promise. I have definitely encountered this phenomenon -- the "black" gear is actually chromy shiny gear, not black.